I joined Humanitas in 2006 as a Physical Therapist and I work with children who live in our Safe Homes project in Romania. Our Safe Homes consist of two residential houses that are lived in by up to sixteen abandoned children with special needs and their foster parents. The children in our care were abandoned by their parents at birth and lived in hospitals or state institutions before they came to us. We offer our children a much better chance at a fulfilling and independent life than if they were cared for by the state. Our children receive a tailored care package, the chance to learn and above all the experience of being loved by foster parents who care for them as if they were their own. I am responsible for the Humanitas Therapy Centre where we run physiotherapy, occupational therapy and rehabilitation programmes for all of the children living in our Safe Homes and those in our foster care programme. Some children respond to the treatments very quickly and make amazing progress in a short period of time, but others require patience and perseverance over many months and sometimes years. To give you an idea of what I do, I will focus on a child I have worked with for nine years, her name is Florentina. Florentina is ten years old and I first met her when she was one, abandoned in a children’s hospital with a medical diagnosis that would have meant her life would be spent lying down in a bed. We brought her to one of our Safe Homes because we knew we could offer her better care and a chance of a life beyond the one that she had been resigned to. I started working with Florentina as soon as she joined us and established a care plan with clear objectives for her physical development. In the first stages I worked intensively to help her control her head, maintain a sitting position and move from lying down to a sitting position - this took three years. She had never been encouraged to sit or move around in the children’s hospital and would have remained in a lying position for the rest of her life had she remained there. The second stage involved teaching Florentina to grip with her hands, to develop hand -eye coordination, muscle development and strength. This took a further two years to achieve. 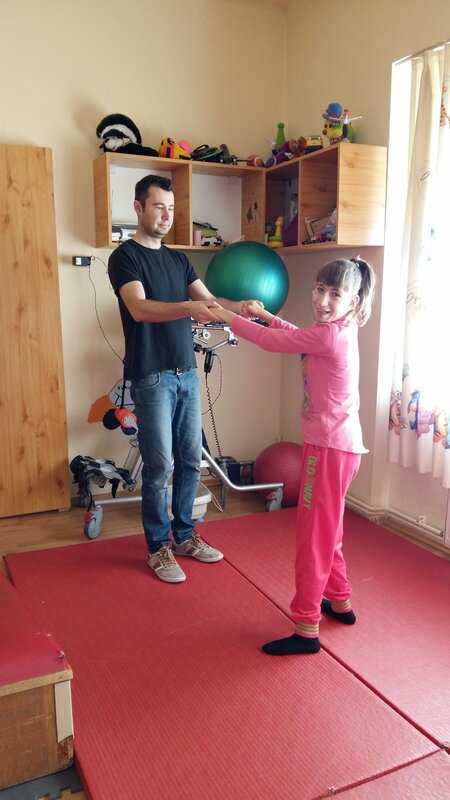 The third stage of her physiotherapy treatment was the greatest challenge of all and involved strengthening her spine and improving her muscle tone so that she had the opportunity to try and walk. Remarkably, last year, Florentina made the first steps she has ever taken on her own. Six months later she managed to walk ten steps without any help. Now she walks in the park holding hands and can move around the living room without help. It took Florentina and I nine years working two hours a day to get to where we are now, but it was worth it. Her life has opened up beyond comprehension and I am really proud of what she has achieved. She is a determined and resilient girl and has defied expectation. Florentina is just one example of how Humanitas offers children a better chance at life. I get real pleasure out of the work that I do and look forward to playing my part in improving the lives of many more children who need our support in future.